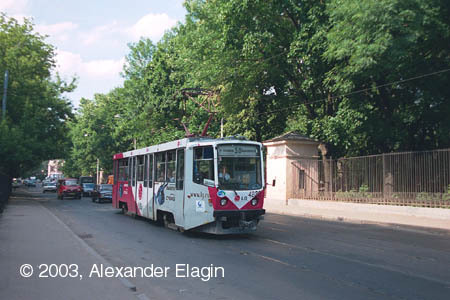 This line, linking Kurskiy Vokzal with Lefortovo district through the narrow lanes of Syromyatniki district, came into being in 1932. 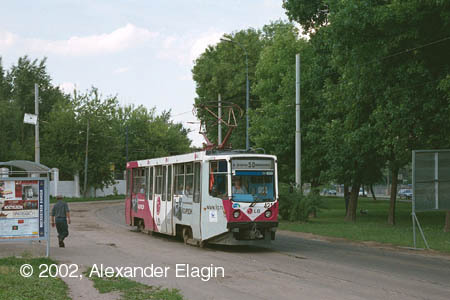 The line is interesting because of varying landscapes and is operated today with route 24, although routes 45 and 50 operated here in 2002 because of reconstruction of Dvortsoviy Bridge in Lefortovo. One of the most interesting objects in this old district is Tupolev aircraft company, one of the major developers of civil and military air vessels in USSR and Russia. But, as you might guess, it is rather hard to find it due to obvious reasons. And, frankly speaking, it is located at some distance away from the tram tracks. A section of the line from Syromyatnicheskiy Proyezd to Mruzovskiy Pereulok is aligned at a distance from the river embankment. Another interesting structure here is a water lock regulating the level of Yauza river up stream. The line becomes more winding after crossing with Mruzovskiy Pereulok. 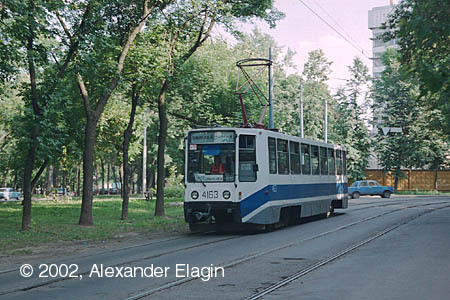 The tracks bend round a solid looking fence, approach the embankment and then turn to northbound Elizavetinskiy Pereulok. A large sports complex is located behind the fence that stretches along almost the whole span of Elizavetinskiy Pereulok. The lane itself looks like a typical old street of Moscow, abundant in trees and, alas, also abundant in motorcars. 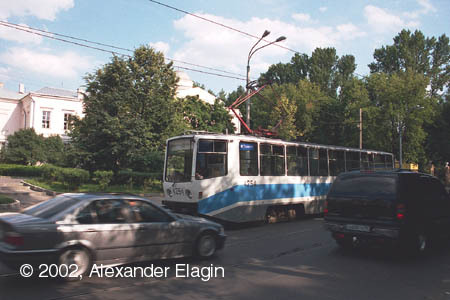 At a crossing of Elizavetinskiy Pereulok with Radio Street the tracks pass by a small public garden and then turn right, to enter a steep gradient uphill.